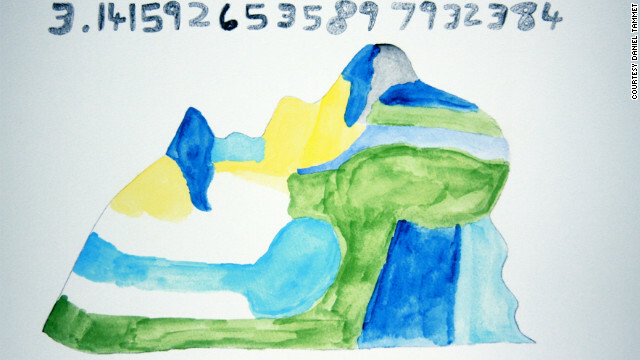 Daniel Tammet painted this picture of how he sees the first 20 digits of pi. In Daniel Tammet's mind, three is a dotted green crescent moon shape, one is a sort of white sunburst and four is a blue boomerang. Every number has a distinct color and shape, making the number pi, which begins with 3.14, unfold like a beautiful poem. For math enthusiasts around the world, March 14 (3-14) is Pi Day, honoring the number pi, which is the ratio of circumference to diameter of a circle. On Thursday, Tammet is promoting France's first Pi Day celebration at the Palace of Discovery science museum in Paris. Tammet's relationship to this number is special: At age 25, he recited 22,514 digits of pi from memory in 2004, scoring the European record. For an audience at the Museum of the History of Science in Oxford, he said these numbers aloud for 5 hours and 9 minutes. Some people cried - not out of boredom, but from sheer emotion from his passionate delivery. Pi is the loneliest number that I ever knew. PI is a most fascinating number. Without it space flight and atomic theory would be impossible.